Getting enough sleep is the most important thing you can do for your body. Support your body in your most comfortable sleep position with this plush yet durable body pillow. Depending on your needs and your favorite position, you can use it under your knees while lying on your back, prop up your arm and leg while lying on your side or try various other positions. The down alternative that fills this body pillow gives exceptional loft and is completely hypoallergenic. The cover is made of 100-percent polyester. For the price I was expecting to not need a cover or a case. The seams are roughly finished with a serger - strings hanging and unfinished in appearance. If you don't mind investing additional money into the purchase of a case/cover it would be OK. I will be returning the item for I do not want to invest $50 into the purchase of a body pillow. 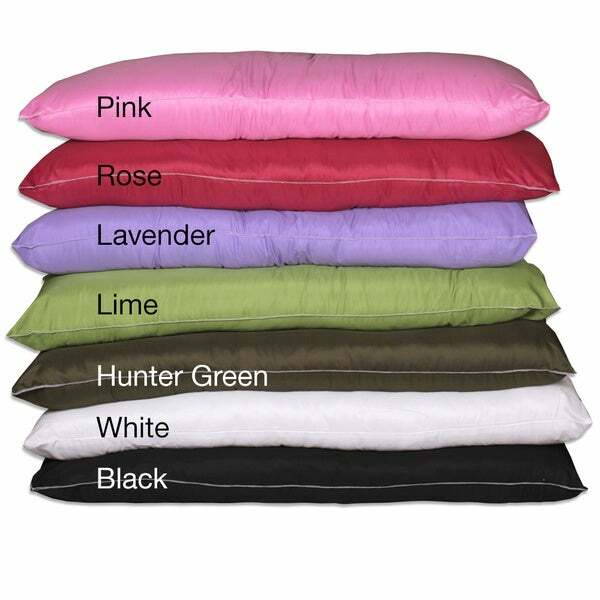 The pillow is great , was disappointed when ordering as the product appears to be available in many colors , but upon ordering was only allowed to choose white.